In this on-demand webinar, viewers will learn how financial wellbeing and comprehensive financial planning technology company, Advizr, is bringing financial empowerment to the employee benefits space. The full spectrum discussion includes views on technology, benefits administration and the workplace with panelists from Advizr, Alight Solutions and Huntington Ingalls Industries. “A Modern Age of Wellbeing: How Fintech is Disrupting the Industry” includes views on technology, benefits administration and the workplace with panelists from Advizr, Alight Solutions and Huntington Ingalls Industries. 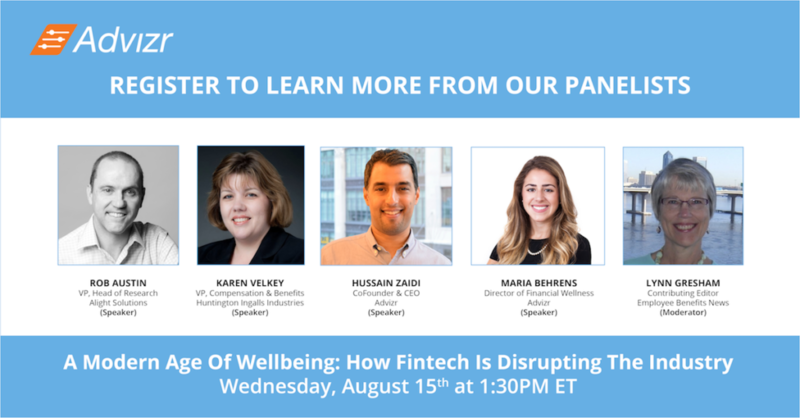 Advizr Co-Founder & CEO, Hussain Zaidi and Program Director of Financial Wellness, Maria Behrens will be participating in the discussion and sharing their insights on how Advizr Workplace is leading the way in leveraging technology to integrate financial planning, financial education, and employee wellbeing.